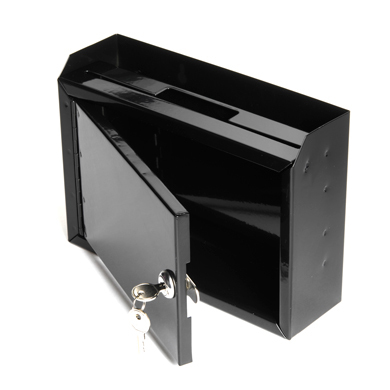 The Black Locking Drop Box is a great investment for businesses who must lock up their valuables or need a secure outside drop off. Made from sturdy steel, the unit has a built in storage compartment which holds forms, note pads, envelopes, and more. Easily holds business sized envelopes. Pre-drilled holes for easy wall mounting. Top drop slot measures 9 in. W x 1/4 in. D.